There were 27 people who came out and joined us for Dr Dettloff’s presentation Saturday. I will type up the notes about local resources which we compiled throughout the day, and distribute them to those who joined us. The group was very interested in the topics, and our farm backdrop helped illustrate many of the topics we went over. I hope to host Dr. Dettloff again next year! 15 minutes south of downtown Issaquah; 15 minutes east of downtown Renton. Holistic approach to soil fertility, including optimal balancing of mineral levels in soil. Use of high-forage diets for large and small ruminants. Foliar spraying for increasing forage nutrition. Proper feeding and butchering for backyard poultry. “Reading” the hair of ruminants to predict production and butter fat content. Ten key veterinary tools, including: aloe vera, tinctures, homeopathy, essential oils, whey products, botanicals (e.g., diuretic and uterine pills, and herbals teas), antioxidants, trace elements (e.g. humates/kelp), probiotics and hydrogen peroxide, and accupuncture. Application of soil fertility principles for vegetable and fruit production in farms and gardens. Homesteading skills that enable greater economic success and self-sufficiency. Questions and active engagement with the material of the seminar are encouraged, as this is for your benefit. Dr. Paul Dettloff received his DVM degree from the University of Minnesota and has conducted a large animal veterinary practice in Western Wisconsin for 35 years. He is the author of the book, Alternative Treatments for Ruminant Animals, a premier resource for organic dairy producers. He has pioneered the use of homeopathics and nosodes in the holistic treatment of dairy animals. His focus on the whole system, from the soil to sustainable management, is the result of years of personal study and practical experience. 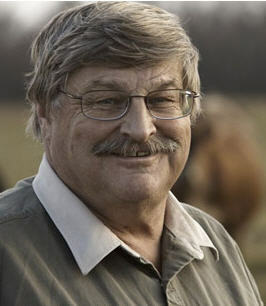 His common sense approach to on-farm production has benefited thousands of farmers. Dr. Dettloff is a consultant and staff veterinarian for Organic Valley Cooperative, consultant to Lancaster Agriculture Products, and owner of Dr. Paul’s Lab. Dr. Dettloff has been a super resource for Kathy in her goat husbandry since she read his book Alternative Treatments for Ruminant Animals (available from Acres, USA). We’d like to learn more from him and to share that opportunity with others. Our goal for the workshop day is to cover the cost of bringing him to this area. We want this event to be family-friendly. Children are welcome for the day. The farm tour from 9-10 a.m. is a good match for any age. Dr. Dettloff will be sharing information with us from 10 a.m.-noon and 1-3:30 p.m. A general Q & A session and will be from 3:30-4:00 p.m. Babies and young children are welcome to stay with their parents during that time, as are any children who are interested in hearing what Dr. Dettloff has to say. We do ask that parents would take their children out to handle any disruption that would prevent others from hearing the speaker. We want children who come to have a positive experience while they are here. Since 2 1/2 hours is a long time to ask children to sit quietly, we will have swings, sidewalk chalk, and soccer balls available for outside play. We will also have an indoor space with playdough, board games and drawing supplies available if it is very rainy or cold. Since the children will be in an unfamiliar place with others they do not know well, it is important to us to have an adult or older teenager “on duty” to supervise. Please let us know in advance how many children you are bringing so that we have adequate supervision available. (If any of you have teens who are responsible and interested in helping, please let us know that too.) Payment for the “playground supervisor” will be collected. We hope to keep the cost to a minimum, and would expect it to be between $1.50 and $3 an hour per child. I (Nathan) will prepare a simple lunch of chili, baked potato, & salad for our family. You are welcome to join us. (I will use the red meat chili recipe from Nourishing Traditions, by Sally Fallon.) To defray the cost of the food, lunch will be $6 per person. Payment for lunch can be made in advance, or at the seminar. Please let me know if I should include you for lunch, so there will be enough to go around. It takes about a 10-minute drive to reach the nearest restaurants from our house. This entry was posted in Cows, Dairy, Farming, Gardening, Goats, Grazing, Pastured Poultry, Soil and tagged building soil, Cows, Dairy, grass, grass-fed. Bookmark the permalink.